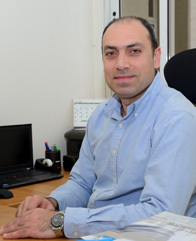 Mohammad Jizi returns to LAU as assistant professor of accounting, after graduating from the University of Durham with a PhD in Accounting and Finance. He also holds an MBA from LAU and a BS in Accounting and Finance from LU. In addition to his degrees, he has obtained a certified internal auditor qualification from the Institute of Internal Auditors in the US. Jizi’s professional career began as an internal auditor in the banking sector, where he gained extensive experience in developing and executing strategic audit plans. He later joined the Advisory and Internal Audit Services at PwC, where he had a leading role in several consultative and business process-reengineering projects in Lebanon and the region. His research is being published in renowned academic journals and his work on corporate governance and financial reporting has been presented at international academic conferences. His current research includes, among others, social and environmental accounting, corporate governance, audit quality and related accounting issues. M. Dah and M. Jizi (2018). Board independence and the efficacy of social reporting. Journal of International Accounting Research. 17(1), 25-45. Authors are alphabetically ordered. B. Al-Dah, M. Dah, and M. Jizi. (2018). Is CSR reporting always favorable? Management Decision, doi.org/10.1108/MD-05-2017-0540. Authors are alphabetically ordered. M. Jizi, and R. Nehme (2018). Board monitoring and audit fees: the moderating role of CEO/chair dual roles. Managerial Auditing Journal. 33(2), 217-243. Dah, M, Jizi, M. and Sbeity, S (2018). Board independence and managerial authority. Benchmarking: An International Journal, 25(3), 838-853. Authors are alphabetically ordered. M. Jizi, R. Nehme, and R. El-Hout (2016). Fraud: Auditors’ responsibility or organizational culture. International Social Science Journal. 66 (221-222), 241-255. Jizi, M. and Nehme, R. (2017). Board gender diversity and firm’s equity risk. Equality, diversity and inclusion: An international journal, 36(7). Jizi, M. (2017). The Influence of Board Composition on Sustainable Development Disclosure. Business Strategy and the Environment, 26(5): 640-655. DOI: 10.1002/bse.1943. Jizi, M. and Dixon R. (2017). Are risk management disclosures informative or tautological: Evidence from the US banking sector. Accounting Perspectives, 16(1), 7-30. DOI:10.1111/1911-3838.12134. Arayssi, M., Dah, M and Jizi, M. (2016). Women on boards, Sustainability reporting and firm performance. Sustainability Accounting, Management and Policy Journal, 7(3), 376-401. DOI (10.1108/SAMPJ-07-2015-0055). Authors are alphabetically ordered. Jizi, M., Nehme, R. and Salama, A. (2016). Do social responsibility disclosures show improvements on stock price? The Journal of Developing Areas, 50(2): 77-95. Nehme, R. Al Mutawa, A. and Jizi, M. (2016). Dysfunctional behavior of external auditors, The collision of time budget and time deadline: Evidence from a Developing Country. The Journal of Developing Areas, 50(1): 373-388. Jizi, M., Salama, A., Dixon, R. and Stratling, R. (2014). Corporate governance and the content of corporate social responsibility disclosure. Journal of Business Ethics, 125(4): 601-615.